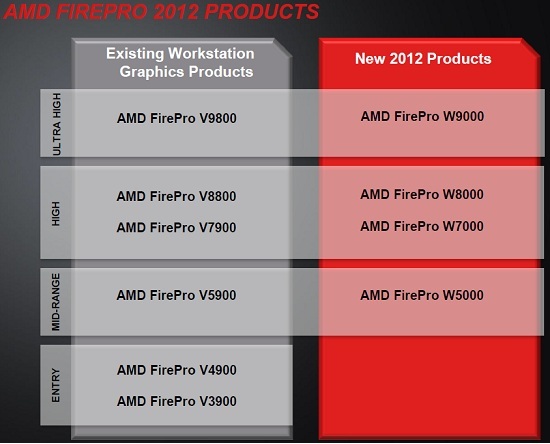 AMD announced months ago that the company would officially launch the FirePro W9000 professional graphics card at the Siggraph 2012 conference that will take place in Los Angeles, California, in early August. True to their word, AMD launched the company’s new southern islands FirePro graphics cards earlier this week. These professional graphics cards bring AMD’s graphics core next (GCN) architecture to the workstation market. This means you’ll see the highest-performing workstation ever offered by AMD. AMD announced four graphics cards this week, ranging from the mid-range to ultra high product lines. AMD has yet to release the new entry level cards, so for now the FirePro V4900 and V3900 will be holding together the bottom of the product stack. 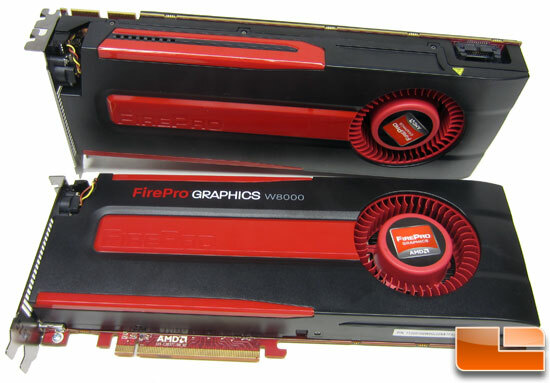 The flagship professional graphics card for AMD is now the FirePro W9000. This is the high-end card that has an SRP of $3,999 (The NVIDIA Q6000 street price is $3500). This card is for the top of the food chain developers and content creators that need to have the best. The W9000 is for all practical purposes a Radeon HD 7970 when it comes to hardware, but it runs at different clock speeds and has twice as much memory as consumer counterpart. This is easily ascertained by the fact that it powered by Tahiti XT graphics processing unit with 32 compute units (2048 stream processors) and 6GB of high-speed GDDR5 memory. The engine clock is 975MHz with the memory running at 1375MHz on a 384-bit bus. The 6GB of GDDR5 memory has a memory bandwidth of up to 264GB/s with these clock speeds. One of the most interesting new features in the FirePro lineup is the addition of ECC support, which is incorporated in the W9000 and W8000 products. ECC is used to insure that errant memory bits flips don’t mess up numeric calculations and is specifically aimed at high performance computing (HPC) codes. The FirePro W9000 will provide 3.99TFLOPS of single precision and 0.998 TFLOPS of double precision compute precision, unlike the Radeon HD 7970 (also based on Tahiti XT), which offers 3.79TFLOPS of SP and 0.947TFLOPS of DP performance, respectively. The difference in compute performance points to higher clock-speed of the GPU on the professional graphics card. The board has six mini DisplayPorts as well as a 3-pin DIN stereo connectors. This means you can run easily run a six panel AMD Eyefinity setup. The W9000 has a maximum TDP of 274 Watts and needs both an 8-pin and 6-pin PCI Express power connector for proper operation. The AMD FirePro W9000 can evaluate an impressive 7.6 Terapixels/sec for 8-bit. Not bad for a card with 4.3 billion transistors made on TSMC’s leading 28nm process technology. The AMD FirePro W8000 professional graphics card has an SRP of $1,599 ($2400 less than the W9000) and is the main rival to the NVIDIA Quadro 5000. This card is aimed the main engineers at major OEM’s or someone doing rendering farms. This card has a 900MHz engine clock and 4GB of ECC GDDR5 memory running at 1375MHz. The FirePro W8000 will provide 3.23TFLOPS of single precision and 0.806 TFLOPS of double precision compute precision. This card has four standard size DisplayPort 1.2 video outputs, but can run a 6-panel setup when daisy-chaining monitors together. 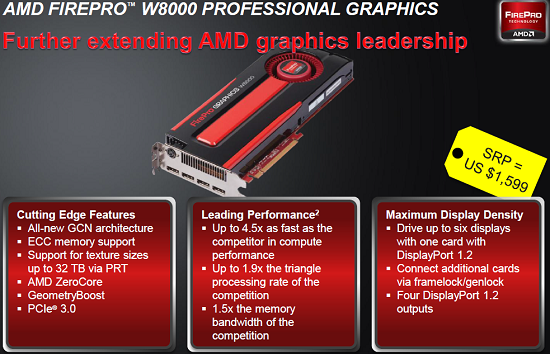 The AMD FirePro W8000 has a maximum TDP of 189 Watts. The AMD FirePro W7000 is the card that most users should be using and is ideal for designing tooling and models and is priced at just $899. This card comes with 4GB of memory and has a memory bandwidth of 153GB/s. This is the ‘workhorse’ of the new graphics card lineup and is the card that AMD plans on selling the most of. 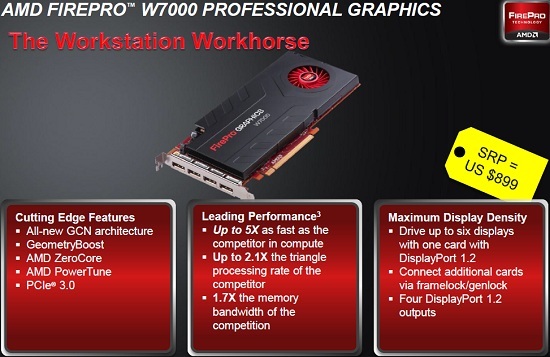 The FirePro W7000 will provide 2.43TFLOPS of single precision. The W8000 has a maximum TDP of <150W. 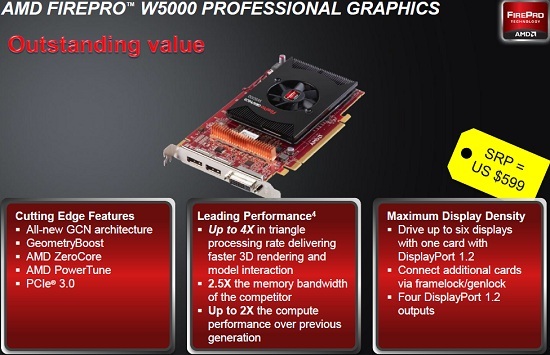 The last workstation card announced this week is the AMD FirePro W5000. This is basically the card that people that can’t afford the W7000 should be getting. It is priced at $599 and is clocked at 825MHz on the engine clock and 800MHz on the 2GB of GDDR5 memory (102.4GB/s memory bandwidth). The FirePro W5000 has 1.27 TFLOPS for single compute precision. AMD sent over the FirePro W8000 and W9000 professional graphics cards, so we will be taking a look at these two beasts today.